In a recent blog, we wrote that one of the important reasons you should hire a real estate lawyer early in the foreclosure process is so you can protect your rights. But what are your rights when you are going through a foreclosure? It’s important to know so you can ensure that lenders, bankers, and the other side’s lawyers aren’t violating them. 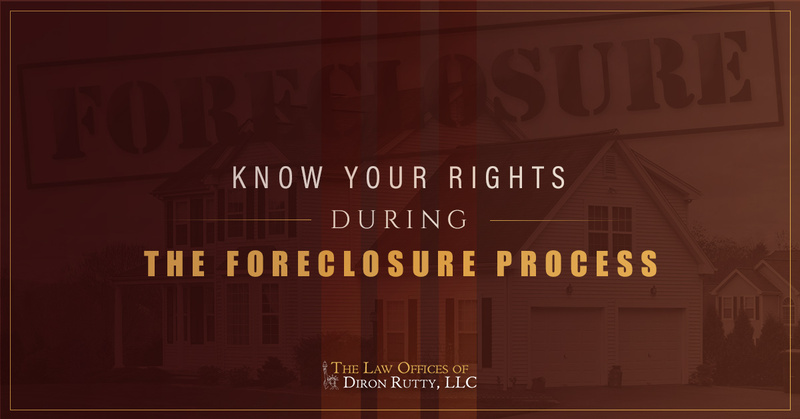 Here are some of the rights you should be aware of having during the foreclosure process. Do You Know Your Rights During a Foreclosure? You have to be 120 days late on your payments for foreclosure to begin. Some lenders like to try to rush through the foreclosure process and start before you are the full 120 days behind on your payments. It’s only once you are 120 days (or about four months) behind on your payments that the lender can actually file a foreclosure notice. Anytime before that and you can catch up your loan without actually entering the foreclosure process. It will still show up as a late payment on your credit report, but it’s significantly less damaging than a foreclosure. You must receive a notice before the foreclosure process can begin. The lender must provide you with a 90-day foreclosure notice. You’ll see this when you are about 90 days late on your payments. The 90-day notice should provide information about how you can bring your payments up-to-date and prevent the foreclosure process from going forward. This prevents the lender from starting the foreclosure process without your knowledge. You have 20-30 days to respond to the foreclosure complaint. If you do not bring your payments up to date and are 120 days behind, then the lender has a right to file a foreclosure complaint with the courts. This officially starts the process. You’ll have 20 or 30 days to respond to the lawsuit (depending on how the notice was served). Responding usually involves acknowledging that you are behind or counter suing the lender for some kind of violation. You have a right to a settlement conference. Within 60 days of the foreclosure filing, you’ll be scheduled for a settlement conference with your lender. During this conference, you and the lender will meet to discuss possibly options to help you avoid the foreclosure and find a way to catch up your payments. You can catch up your payments anytime before the foreclosure is finalized. Even if you can’t catch up your payments at the time of the settlement conference, you still have time. You can catch up on your late payments at any time up until the foreclosure is finalized. At that point, you’ll have very few options and your home will likely go up for sale at auction. Until the foreclosure is finalized, you should do your best to find a way to catch up on your payments or change the terms of your loan in order to stop the process and avoid losing your home. You cannot be harassed for payment. Don’t forget that throughout the entire foreclosure process, you are protected by anti-harassment laws. Debt collectors, lenders, and other parties cannot harass you for payment on your delinquent loan. Most lenders are aware that clients can end up suing them for violations of anti-harassment laws, so they aren’t likely to do so. However, if their tactics are becoming aggressive, it’s important to speak to your lawyer about your options. An uncontested foreclosure can be finalized in New York in as little as 120 days. That doesn’t give you much time to try to catch up on your payments or renegotiate the terms of your loan. However, there are a number of ways that you can slow down the foreclosure process in order to give yourself enough time to get the necessary funds together. That’s where an experienced real estate lawyer can help. Let the Law Office of Diron Rutty help you find the solutions that you need in order to save your home. If you are facing a foreclosure, get in touch with us by giving us a call or contacting us through our website. We’ll set you up with a complimentary consultation so you can learn more about our services and how we can help you.